Every guitar player has had the same problem, especially when starting out: there’s a bazillion acoustic guitar string types out there, and short of trying them all—how the heck do you figure out which one is right for you? Well, if you’ve got the budget, we certainly recommend trying them all and seeing what works best for you, but that takes some serious scratch. And truth be told, often times, the quest to find the perfect string gauge and type is an ongoing process throughout your playing life, due to changes in taste and preference over time. So let’s simplify things a bit… The big string companies are always pouring money into developing “new” string lines that they can dump money into marketing, and of course, charge you plenty more—but throughout history, the debate has come down to two heavy-weights, the all-time most popular acoustic guitar string types: Phosphor Bronze vs 80/20 Bronze. Plenty of big-time guitarists are fans of each of these alloys, and the differences between them can have a huge impact on your tone. What are they actually made of? What do they sound like? How do you know which one is right for you? Let’s delve into the details of these two acoustic guitar string types and see if we can’t answer a few of those burning questions, and put a rest to the Phosphor Bronze vs 80/20 Bronze debate—as far as what’s best for you, anyway. Straight off, you should know that 80/20 bronze strings were the original acoustic guitar string in the annals of guitar history (for the steel string acoustic, anyway). The 80 and 20 represent the ratios of copper and zinc present within the wrap wire, respectively (for the most part, all guitar strings use the same core wire, known as Music Wire or Piano Wire, whether acoustic, electric, or bass). Also known as brass, this 80/20 copper to zinc alloy was chosen by John D’Adarrio Sr. and John D’Angelico in the 1930’s. It was the first popular and commercially available acoustic guitar string. The bright, crisp, yet bass-heavy tone that 80/20 strings impart—think a bit like a scooped EQ, with less mids than other strings—is one that many guitarists love, but these strings are not without drawbacks. Copper is highly corrosive which causes the strings to age very quickly. The zinc within the alloy helps slow the aging process a little bit, but ultimately the short life cycle of these strings forced string manufacturers to try and find a new alloy that would retain its tone longer. In 1974, D’Addario released a new line of strings known as phosphor bronze. These strings were specifically developed to address the issue of the quickly-aging 80/20 strings. 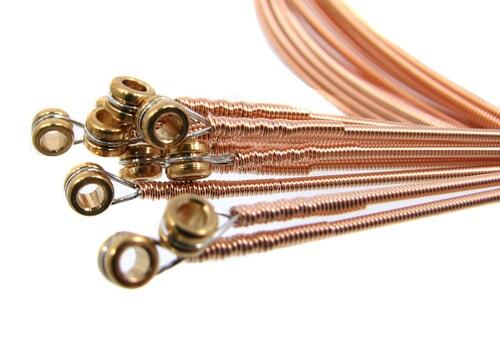 Consisting of about 92% copper, 8% tin, and 0.2% phosphorus (the phosphorous and tin are what keeps the alloy from tarnishing so quickly), these strings produce a much different tone than 80/20 strings and now make up the majority of acoustic guitar strings on the market today. While history is always good to have, when it comes down it, what matters most in the phosphor bronze vs 80/20 bronze debate is how they sound, and how they feel. As mentioned above, 80/20 strings produce a crisp, bright, and projecting tone that many vintage guitar enthusiasts love. These strings provide the quintessential acoustic guitar tone that was heard on many records from the 1960’s and 1970’s—bright, bass-y, and without much mids. Often times, due to their bright and brilliant nature, 80/20 strings are best paired with dreadnought-type acoustic guitars including models by Martin, Taylor, and Gibson. Guitars with generally darker tonal qualities lend themselves well to these strings to produce a well-balanced tone. Phosphor strings have a darker, fuller tone than 80/20 strings and add a bit of warmth. A good rule of thumb is that once they settle in after a few hours of use, they have about 80% of the brilliance of a new set of 80/20 bronze strings. The added phosphorus gives a bit more tonal softness compared to other string types and the pick attack is generally less pronounced than in their brighter counterparts. As with 80/20 strings, for most folks, the best type of acoustic guitar paired with phosphor strings is one that has the opposite tonal qualities of the string. Since phosphor strings produce a darker tone, they pair well with brighter-sounding acoustic guitars such as models manufactured by Taylor, Ibanez, Alvarez, and Takamine. Which of the Acoustic Guitar String Types is Right For You? Making the choice between 80/20 strings and phosphor strings is mainly up to personal preference. All guitarists, big and small, have their own opinions on what strings sound good to them. Since both 80/20 strings and phosphor strings have their own unique tone, the great debate of phosphor bronze vs 80/20 bronze comes down to a matter of personal taste. If you like a bright and brilliant acoustic tone and/or play a darker-sounding acoustic guitar, 80/20 bronze strings like our Bright Brass strings may be better for you. If you prefer a darker, mellower, or more natural tone, you might enjoy phosphor bronze strings like our Natural Bronze strings. Every guitarist has a different style, different ears, and different expectations out of his or her guitar, so when it all comes down to it, the best advice we can give is to try both acoustic guitar string types, in different gauges, and see which you prefer on your own guitar.